Historically speaking, the night before Thanksgiving can be pretty hit or miss with shows,no matter the artists involved. Holiday travel, or incoming guests can severely diminish a potential fanbase. 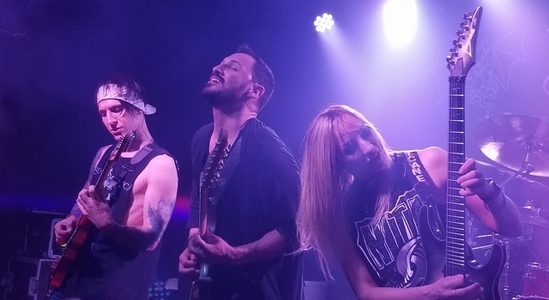 But that’s also why seeing such a packed house at Dingbatz that evening is an encouraging feeling for Angel Vivaldi’s current Guitar Collective tour, which features Nita Strauss and Jacky Vincent for this year’s iteration. A full evening of guitar mastery followed for all of those in attendance. First up was the sole local act, Etherius, whom this scribe first caught earlier in the year at Dingbatz. At this point, their debut EP, Threads of Life, has been released and the band saw fit to give it an excellent performance on this night. 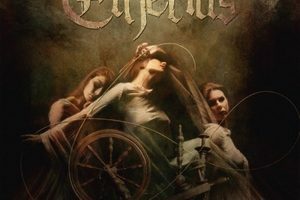 Thrashy and energetic, but still showing plenty of instrumental prowess, it’s quite easy for anyone to get into this act, even if they aren’t big on instrumental metal. Live they cranked up the heaviness further, and guitarist Jay Tarantino brought some impressive shred. 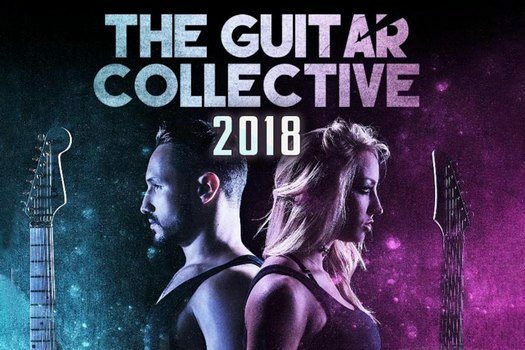 It would also be the first of three sets that night from him, as he is playing rhythm guitar for both Nita Strauss and Angel Vivaldi on this tour, an impressive feat for sure. Jacky Vincent came out to the stage all on his own, his guitar and some mostly electronic sampling being all that stood between him and the audience. A stunning feat in and of itself – all eyes upon him with no room to hide from any mistakes. Vincent was strikingly impressive with almost 30 minutes of essentially straight shredding, sweep-tapping, and more, barely stopping but for a few moments to thank and interact with the crowd. He let the guitar do all of the talking for him, and it was very clear that the audience was impressed. The speed factor (and power metal influences) made it even more show-stopping, especially with the amount of melody that remained intact. He’s bound to impress quite a few as this tour continues. With her debut solo album just hitting the shelves, it was great timing for Nita Strauss to be hitting the tour circuit. This is her first solo tour as well, something that made it all the more special to her (and the crowd), and was easily evidenced by the near constant grin on her face from the beginning to the end of the set. She concentrated mostly material from the excellent Controlled Chaos, but she also saw fit to share a shredding instrumental version of Alice Cooper’s “I’m Eighteen” which was a cool addition. The combination of melody and intense shred (not to mention heaviness) made Strauss’ set fun to watch, alongside the interactions between Strauss and the other band members. Again, much like Vincent before, she let the music do most of the talking save for some song introductions and thanks to the crowd, who were happy to reciprocate said feelings. Last up was of course, Angel Vivaldi. Visually, there was so much to take in outside of his charismatic guitar playing. The lights show was quite impressive, nearly offering itself as another performer on stage alongside Vivaldi and enhancing the vibes. But that’s not to downplay Vivaldi himself, who was an all-around impressive performer. Energetic and enigmatic on stage, he brought plenty of style to his melodic yet aggressive tracks and was very clearly having a fun time – much like this evenings performers as a whole, he was constantly grinning and smiling his way through the set. He engaged with the crowd between songs with plenty of humor and a bit of seriousness when needed, such as a dedication to the recently deceased Oli Herbert (of All that Remains). Outside of performing “Dopamine” (of which Herbert participated on), he also tossed in a few famous All that Remains riffs throughout the evening, which was a touching sentiment. 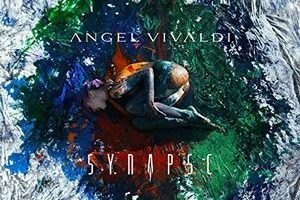 Vivaldi’s set list was also a strong suit, providing some cuts from last year’s Synapse as well as dipping into the back catalog. Some over the top stage moments from Vivaldi only added to the show, all of which showed why he is not just an impressive guitarist but an exceptional live performer. The best was truly saved for last though, as Nita Strauss joined Vivaldi on stage for a live rendition of “Serotonin.” Hard not to smile watching the two of them interact with each other on stage, in the same playful and engaging manner that the track’s video showcased. But there was more still, as Jacky Vincent then joined the stage for one more song, which now showcased 4 guitarists on the stage: Vivaldi, Strauss, Vincent, and Tarantino on rhythm. What followed was a breath-taking performance and grin-inducing interaction between the performers, with Vivaldi, Strauss, and Vincent making faces, egging the others on playfully, and delivering plenty of world-class shred. While the night as a whole was excellent, it could be argued that these last two songs were worth the price of admission alone, showcasing a rich interaction between all members of the tour in a way that should leave show-goers with an involuntary smile from ear to ear. Do not leave this tour early!